The Republic of Yemen is located on the southwestern end of the Arabian Peninsula. It is the second largest country on the peninsula, occupying 527,970km2. Yemen borders the Arabian Sea, and is located between Oman and Saudi Arabia. Yemen has a varied geography, with coastal plains and highland areas in the west, highlands and desert areas in the east, and a central plateau at over 2,000m elevation. With renewable water resources of only 125m3/capita/year, Yemen is one of the most water-scarce countries in the world. Oil was found in Yemen in the 1980s, in Marib governorate in North Yemen, and in Shabwa and Hadramaut governorates in South Yemen. The Republic of Yemen was created in 1990, with the unification of Yemen Arab Republic (North Yemen) and People’s Democratic Republic of Yemen (South Yemen). 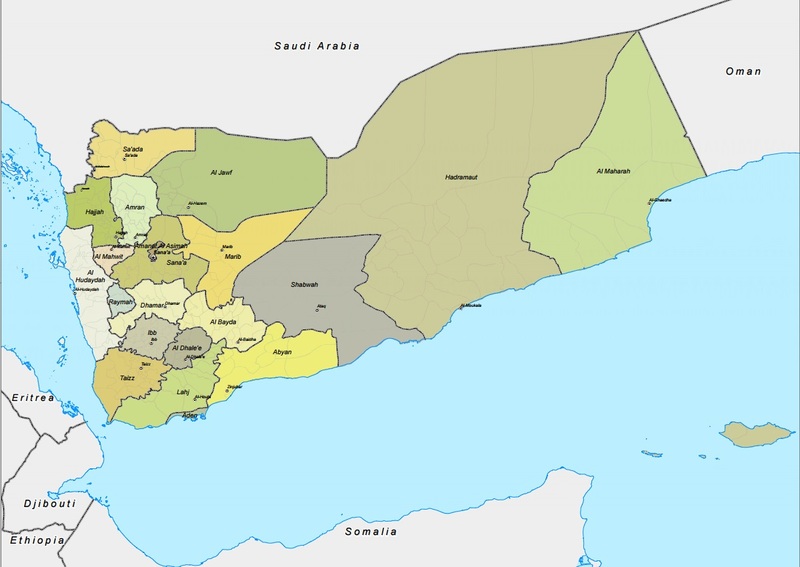 Yemen is divided into 21 governorates and one municipality. The governorates are divided into 333 districts.? ????? Natural hazards: The most common natural hazards are sand storms and dust storms in summer, from April to August.? Yemen also experiences landslides and floods, and, less frequently, earthquakes and volcanic eruptions.? In April 2016, 49,000 people across seven governorates were affected by flash floods and landslides.? Yemen has 12 volcanoes, with around four million people living within 30km of a volcano.? In 2007, at least four people were killed when a volcano on Jabal al Tair island, off the coast of Al Hudaydah, erupted.? The 1982 North Yemen earthquake with an epicentre close to Dhamar city killed 2,800 people and displaced an estimated 700,000.? Drought will be an increasing problem due to water scarcity.? Yemen’s economic vulnerability in combination with its natural disaster exposure has led to a high score on the World Risk Index.? Environmental issues: Yemen has very limited natural freshwater; its renewable water resources are about 2% of the global per capita average.? Desertification (land degradation caused by aridity) and overgrazing are problems.? The Republic of Yemen was formed in May 1990, following the unification of the Yemen Arab Republic (North Yemen) and the People’s Democratic Republic of Yemen (South Yemen). South Yemen was a part of the British Empire from 1839 to 1967, while cities in North Yemen were under the control of the Ottomon Empire until its dissolution in 1918. Rural areas had until that point been governed by Zaidi imams, and in 1918 the Zaidis seized control of the whole of North Yemen. Following the end of British rule, South Yemen aligned itself with the Soviet Union and implemented socialist policies, while North Yemen kept a market economy and forged ties with Saudi Arabia and the West. The 1970s and 1980s were marked by periods of conflict between North and South Yemen. With the fall of the Soviet bloc in the late 1980s, South Yemen lost an important source of financial aid and the ruling Yemen Socialist Party (YSP) lost important political support. The discovery of oil fields that stretched through both countries was another incentive for unification. North Yemen’s President Saleh became head of state of the unified country, and remained so for more than 20 years.??? In May 1994, a civil war began between North and South. The southern and northern militaries remained separate entities following unification, and the stronger northern military defeated the southern forces in July 1994. An estimated 10,000 people were killed, and the war proved highly damaging to the Yemeni economy. Southerners have continued to seek a separate state in the south since the war, and in 2007 the Southern Movement was formed.??? The Houthi insurgency began Northern Yemen in June 2004, with the Houthis stating that their aim was to end government discrimination against Zaidi Shias. Initially, fighting took place mainly in Sa’ada governorate in northwestern Yemen, the Houthis’ stronghold. The conflict began to escalate in 2009, when more than 250,000 people were displaced.?? Protests erupted in 2011, as the ruling General People’s Congress moved to extend, or completely remove, presidential term limits, potentially enabling President Saleh to become president for life.? The Hashid tribal confederation, previously aligned with President Saleh, supported the protesters and were for several months involved in armed clashes with pro-Saleh forces.? President Saleh eventually stepped down and his former deputy Abd Rabbuh Mansour Hadi took over.? A transitional phase began, in a deal brokered by the Gulf Cooperation Council and supported by the United States.? From the first, the transitional Government was challenged by the Houthis, tribal groups, Al Qaeda in the Arabian Peninsula (AQAP), and southern separatists.? The Houthis took advantage of state weakness and gained de facto control over large areas of the north; taking over local administration and collecting taxes. AQAP gained control over several cities in the southern governorate of Abyan.?? In September 2014, conflict escalated further. Houthi forces advanced to the capital and took control. Former President Saleh aligned himself with the Houthis and used his influence to convince tribes formerly a part of the Hashid confederation also to join forces with the Houthis. In January 2015, the Houthis rejected a proposed new constitution, and the following month President Hadi fled to Aden. In March, Houthi forces advanced south, and President Hadi escaped to Saudi Arabia. On 25 March, a Saudi-led coalition began airstrikes in support of pro-government forces. As of July 2015, Houthi insurgents control large parts of the country. Islamist groups, including AQAP and Ansar al Sharia, have exploited the power vacuum to take control of large areas in southeastern Yemen. As of end of June 2015, more than one million people are internally displaced.????? State institutions have traditionally been weak in Yemen, and tribes have generally had great autonomy. Tribal law has established justice and regulated conflict for centuries in the absence of a strong centralised legal system, and it remains the main source of legislature outside of major cities.?? General People’s Congress (GPC): Yemen’s ruling political party was also the ruling party of the North before unification. It was founded by former President Saleh in 1982 as a party of national consensus, and does not adhere to a specific ideology. It won a majority of seats in the House of Representatives in 1993, 1997, and 2003. Saleh remains leader of the GPC, which continued to hold a majority in the Assembly under Saleh's successor, President Hadi. The GPC remains influential in local politics.??? Al Islah: Also known as the Yemeni Congregation for Reform, the conservative Islamic Al Islah Party is the largest political opposition party. Formed in 1990, after unification, the party adheres to a socially conservative ideology based on Islamic principles. With an estimated five million supporters, Al Islah is supported by the Yemeni Muslim Brotherhood and the Hashid confederation. Al Islah members took part in organising protests and pressuring then-president Saleh to resign in 2011.?? Tribal confederations: While the Bakil is the largest tribal confederation, the Hashid is more politically active and has been influential in Yemeni politics. Compared to the other tribal confederations, the Hashid tribes are less scattered, and have generally been more united and better organised. Former President Saleh’s tribe was a member of the Hashid confederation, and his reliance on tribal bonds to consolidate his authority gave the Hashid a strong influence throughout his presidency, in particular in northern Yemen.?? Houthis: The Houthis, also referred to as Ansar Allah, are a tribal movement of Zaidi Shias based in Sa’ada governorate. Zaidi communities were discriminated against through both religious and social policies during Saleh’s presidency, and Houthis have been fighting the central government for the last decade. They take their name from their first leader, Hussein al Houthi, who was killed by government forces in September 2004.? During the 2011 transition process, the Houthis in particular objected to the proposed transformation of Yemen into a federal state of six regions, and demanded a greater share of power in the federal government. Houthis took control over large areas of the north in 2011. Estimates put the number of Houthi militants at around 20,000–30,000.????? Southern Movement: Southern secessionism was revitalised in 2007, initially in the form of protests by pensioners not receiving their benefits. The Southern Movement, also referred to as Al Hirak, was formed by a loose coalition of political, tribal, and religious groups, with the stated aim of re-establishing South Yemen as a separate state. Since the escalation of the current conflict, the Southern Movement supported President Hadi, but in 2017 fractured to form a third government.? ???? AQAP, Ansar al Sharia, and more recently Islamic State (IS) have exploited insecurity in Yemen to expand their presence. AQAP is based in the south and east. Ansar al Sharia has gained a foothold in the south and is believed to be a local branch of AQAP. It has gained popularity in rural areas by providing electricity and water to the population. The Yemeni Government, in alliance with the United States, has been fighting Al Qaeda since 1998.?? Legal system: The 1991 Constitution designated Sharia as the principle source of legislation, while a 1994 amendment declared Sharia as the “basis of all laws”.? Yemeni state law also incorporates elements from tribal laws, Egyptian and other Arab laws, and international principles.? In rural areas, tribal law is the predominant arena of justice, and according to a Yemeni NGO, up to 90% of conflicts are resolved by tribal law structures.?? Political institutions: Yemen’s bicameral structure was put in place by the 1991 Constitution. The Shura Council has 111 members, appointed by the President, and the House of Representatives has 301 seats, with members elected by popular vote to serve six-year terms. The President is directly elected for a seven-year term. Government authority is centralised, and district and governorate councils have had limited authority due to the dominance of the GPC at both local and national levels. Local government is divided into governorate councils and district councils, with 431 seats and 6,896 seats, respectively.???? The Houthis dissolved Parliament in February 2015.? Elections: Elections have been judged to be relatively free and fair, with some instances of irregularities. After unification, the GPC and the South’s Yemeni Socialist Party (YSP) agreed on a fifty-fifty power-sharing arrangement, despite South Yemen’s much smaller population. In the first parliamentary election after unification, held in 1993, the GPC won 122 of 301 seats. President Saleh won the first presidential election, in 1999. He was again easily re-elected in 2006. The 2009 parliamentary elections were postponed as opposition parties threatened to boycott them, and put off again in 2011 as a result of the uprising against President Saleh. In February 2012 President Hadi ran unopposed, originally intending to hold the position as interim president for two years. Hadi’s term was extended in early 2014 in order for a new constitution to be finalised. In the last local elections in 2006, GPC won 85% of seats at the governorate level and 76% of district-level seats.??????? Security forces: As of 2013, Yemen had land forces, naval and coastal defense forces (includes marines), air and air defence forces, border guards, police forces and strategic reserve forces. In 2014, Yemen’s military expenditure amounted to 4.02% of GDP.? The Yemeni army is deeply divided. During the 2011 protests, hundreds of troops and officers defected to the side of the protesters. Following the escalation of conflict in 2015, some factions of the army allied themselves with the Houthis against President Hadi, whilst some continued to support President Hadi.?? Paramilitary security forces affiliated with the Political Security Office and the Interior Ministry reportedly torture and abuse detainees.? Corruption: Yemen ranks very low on Transparency International’s Corruption Perceptions Index, at 161 out of 175 countries. The public sector is perceived to be highly corrupt. Transparency regarding public funds is considered minimal.? Auditing and investigative bodies are not sufficiently independent of executive authorities. Most legal safeguards against conflicts of interest are lacking.? Freedom of expression: Freedom of expression and freedom of the press is highly limited. The Press and Publications Law specifically bans criticism of the head of state and publication of material that “might spread a spirit of dissent and division among people”. Yemen has two specialised courts that deals with the prosecution of journalists. .??? Attacks against journalists and media workers are frequent.?? Yemen is a member of the United Nations, the Arab League, and the Organisation of Islamic Cooperation (University of Michigan 2015). US: Yemen has been an important ally to the US in the fight against Al Qaeda. The US has waged a longstanding drone campaign against AQAP in Yemen, and the US has provided both military and economic support to Yemen. The US supported the transition that began in 2011.?? Saudi Arabia: Previously a strong supporter of President Saleh and now of President Hadi, Saudi Arabia is Yemen’s largest provider of development assistance. It has demanded that the Houthis step down and President Hadi be reinstated. A Saudi-led coalition of Arab states began airstrikes on Houthi positions in March 2015. Saudi authorities claim that Iran supports the Houthis both financially and militarily, and are concerned about the possibility of increased Iranian influence in Yemen. Iran has refuted the claims.??? Yemen is a low-income country that is highly dependent on declining oil resources for revenue. Before the escalation of the conflict in 2015, oil and gas income accounted for roughly 25% of GDP, and 65% of government revenue.? Revenues were appropriated by President Saleh to enhance his power through a personalised patronage system. Oil-rich regions remain among the least developed areas in the country, which has led to attacks on installations by tribal groups. Attacks on oil infrastructure by Islamist groups have led to significant short-term disruptions in recent years.??? Compared to most of its Gulf neighbours, Yemen’s oil reserves are smaller.? Two-thirds of known oil reserves were depleted by 2003 and reserves may run out completely in the coming years.?? Yemen’s support for Iraq during the 1990–91 Gulf War had significant economic consequences as it alienated Saudi Arabia and Kuwait, which had provided critical financial assistance to Yemen. The 1994 civil war further adversely impacted the Yemeni economy.? Gross national income per capita: USD 1,330.? Gross domestic product (GDP) per capita: USD 1,376 (2012).? GDP real growth rate: 1.9% (2014 est.).? GDP composition by sector of origin: agriculture: 9.2%; industry: 26.8%; services: 64%.? Currency: Yemeni Rials (YER). 1 USD = YER 214 (June 2015).? Inflation: Inflation of consumer prices was 19.5% in 2011; 9.9% in 2012; 11% in 2013. Inflation was 15.3% in 2011; 1% in 2012; 7.9% in 2013.? Budget: In 2014, government revenue was USD 10.26 billion; expenditure was USD 14.34 billion.? Unemployment: In 2010, unemployment was estimated at over 52%.? The 2014 estimate was 27%.? Labour force per occupation: Most people are employed in agriculture and herding; services, construction, industry, and commerce account for less than 25% of the labour force.? Main export products: crude oil, coffee, dried and salted fish, liquefied natural gas.? Main export partners: China 29.4%, South Korea 16%, Thailand 14.7%, India 8.8%, Japan 6.1%, UAE 5% (2013).? Main import products: Food and live animals, machinery and equipment, chemicals.? Main import partners: China 15.5%, UAE 13.4%, India 9.5%, Saudi Arabia 6.3%, Kuwait 4.7%, Turkey 4.4% (2013).? Key industries: The economy is founded on revenue from oil and natural gas. Smaller industries include small-scale production of cotton textiles, leather goods, food processing, handicrafts, aluminium products, cement, and commercial ship repair.? Remittances: USD 3.343 billion in personal remittances in 2013.? Mass expulsions of Yemeni workers from Saudi Arabia, following a campaign to deport undocumented migrants which began in 2013, could result in estimated USD 1 billion in lost remittances over the coming years.? In 1991, unemployment became a major issue when hundreds of thousands of Yemenis returned from the Gulf states.? Yemen was ranked 168 out of 180 in the 2015 World Press Freedom Index.? Low literacy rates mean that the majority of Yemenis get their news from TV or radio, which is mostly state-controlled.? Airports: As of 2013, Yemen had 57 airports, including 17 with paved runways. The country’s main airport is in Sana'a.? Roadway: 71,300km; 6,200km are paved.? Roads in the north are generally in better condition than those in southern parts of Yemen.? In 2014, the World Bank granted funds for a 710km highway that would run from Sa’ada to Aden; as of June 2015 the project is on hold.? Ports: Yemen’s main ports are Aden, Al Hudaydah, Al Mukalla, and Mocha; Aden is the primary port. Ras Isa is the loading point for oil exports, and a small amount of cargo passes through Nishtun.? Electricity: In 2010, 45% of the population had access to electricity.? Pipelines: According to the US Government, as of 2007 Yemen had 1,402km of pipelines: 1,309km of oil, 71km of gas, and 22km of liquid petroleum gas.? TV: In 2002, 43% of households had a TV? In 2014, the government controlled four TV stations.? Stations from Oman and Saudi Arabia can also be accessed.? Houthi forces took over the state-run TV station and news agency when they seized control of Saana in January 2015.? Radio: In 2014, the government controlled 12 radio stations, while seven private radio stations were on air.? Print: Yemen has a number of newspapers; many are owned by the government or opposition parties. Yemen’s two daily newspapers, Al Thawra and Al Jumhuria, are both government-owned. In 2003, only 4.4% of the population read one newspaper on a weekly basis.?? Print media is strictly regulated. Continued insecurity and lack of resources such as fuel and paper are major challenges in printing and distributing newspapers.?? Internet: As of 2013, 20% of the population had access to the Internet.? The Government owns Yemen’s two internet service providers.? Authorities block websites deemed offensive and some websites with political discussions? Telephone: 1.1 million land lines were in use as of 2012 and 13.9 million mobile cellular users.? As of June 2015, a number of large NGOs and most UN agencies are present in Yemen.??? Many organisations previously present in Yemen suspended activities or moved to remote operations after the escalation of the conflict.? Due to severe access issues caused by insecurity, limited assistance gets through to the affected population.? National NGOs and authorities’ capacity varies widely. Concerns persist about the independence and neutrality of some local organisations and their ability to deliver principled humanitarian aid.? Yemen’s population is mostly rural: around 70% of people live in rural areas, distributed over most of the country. Villages are mostly small.? Yemen’s major cities include the capital Sana'a, the southern city Taiz, the western port city al Hudaydah, and the southern port city of Aden. In 2011, 2.4 million people lived in Sana'a.? Before unification, the population of South Yemen was about a quarter of North Yemen’s population.? Arabic is the official language of Yemen. The population is predominantly Arab, while there is a small presence of Afro-Arabs (belonging to the Muhamasheen minority group), South Asians, and Europeans.? Tribes in Yemen have close to state-like functions, as state structures are weak and security is fragile. The tribal leaders, sheikhs, have varying degrees of power and influence.?? Tribes have throughout history fought each other and the state over territory and taxes, among other issues. The three major tribal confederations are the Hashid in Amran governorate; the Bakil in the north of Sana'a, and the Madhaj, which is mostly concentrated in the central regions. Bakil has the largest population, while both the Bakil and Hashid confederations are believed to number several hundred thousand. Tribal structures are particularly strong in the north. Southern tribes generally have less influence on the national level as South Yemen pursued detribalisation before unification.?????? 99.1% Muslim (official religion; an estimated 65% are Sunni and 35% are Shia); 0.9% other (includes Jewish, Baha'i, Hindu, and Christian; mostly refugees or migrants) (2010 estimates).? Zaidi Shia (35%), living mainly in Dhamar governorate and to the north; Muhamasheen (2–5%), mostly on the outskirts of major cities; and Ismailis (a few thousand), mainly in Jabal Haraz, a mountain region close to Sanaa.? In 2015, Yemen was ranked as the least gender-equal society in the world.? Yemen’s Personal Status Law contains provisions that discriminate against women in relation to marriage, divorce, custody of children, and inheritance.? It also bars women from leaving their house without permission from their husband.? There is no legislation in place addressing domestic violence, which is believed to be widespread, although accurate figures are not available. According to a 2011 study, 90% of women face sexual harassment in the streets.? 25% of women take part in the labour force.? In 2014, one out of the 303 seats in the national parliament was held by a woman.? In court, a woman’s testimony is in some cases considered to be worth half of a man’s, and in other cases not accepted at all.? There are over 250,000 registered refugees in Yemen: the majority are Somalis and Ethiopians, as well as an unknown number of migrants travelling between the Horn of Africa and the Arabian Peninsula.? Migrants and refugees are overwhelmingly male, with women comprising only around 20% of the population.? Yemen is the only country in the Arabian Peninsula that is a signatory to the 1951 Refugee Convention and its 1967 Protocol.? Prior to the 2015 escalation of the crisis, 306,964 people were internally displaced.? Over 2014, localised conflicts displaced approximately 100,000 Yemenis, mostly for a matter of days.? Yemen is reportedly the second most heavily armed society in the world. 11 million firearms are estimated to be in civilian ownership, although the claim is hard to verify. Norms and social practices around weapon ownership and use appear to be weakening as insecurity grows.? Yemen is the poorest country in the Middle East, with more than half of the population living below the poverty line in 2014.?? In 2014, 10.6 million people were in Crisis (IPC Phase 3) or Emergency (IPC Phase 4) food security.? Since the escalation of conflict, over 17 million people are facing Crisis or Emergency food security outcomes.? Only 3% of the country is considered arable land.?? As a result of low levels of rainfall, agriculture is highly dependent on the extraction of groundwater, a resource that is being depleted.? 90% of Yemenis depend on commercial food imports for staples.? Agriculture employs more than 54% of the work force, and two-thirds of the population depend on agriculture for income and food.? Food production includes barley, wheat, and sorghum.? Other production includes coffee and khat (chewing khat produces a mild high; a majority of Yemenis use it).?? The remaining work force is employed in the service, construction, commerce, or industry sectors.? Other sources of income include beekeeping and petty trading.? Coping mechanisms in Yemen are limited after years of instability and poor existing levels of resources.? The Yemeni population’s coping mechanisms include rationing of water consumption; reducing living expenditures to a minimum; spending savings; selling assets, including livestock; and seeking alternative livelihood options.?? Available coping mechanisms have decreased following the escalation of conflict, and many households are resorting to unsustainable coping mechanisms to survive.? In 2017, the UN estimates that around 15 million people are in need of basic health services.? More than half of the population lacked access to healthcare before the escalation of the conflict, due to a lack of facilities in rural areas and the inability of the poor to pay for healthcare.? Health facilities are under-equipped, understaffed, and subject to persistent supply shortages.? The Ministry of Public Health and Population is responsible for Yemen’s health sector. According to government data from 2013, Yemen has 4,162 health facilities: two referral hospitals, 54 general hospitals, 185 district hospitals, 873 health centres, 3,007 health units, and 41 health complexes.? The majority of health facilities are located in towns and cities.? In 2010, only 35% of the rural population was covered by health services.? In 2013, per capita expenditure on health was USD 200, and total expenditure was 5.4% of GDP.? Since the escalation of conflict, health facilities have closed due to insecurity and fuel shortages, people cannot access health facilities that remain open, and medical supplies and vaccines are in short supply.? The maternal mortality ratio is 270 per 100,000 live births: women between the ages of 15 and 49 face a 14% chance of dying from maternal causes.?? Yemen has among the highest fertility rates in the world, with each woman having an average of 5.1 children.? Yemen also has a high rate of adolescent fertility and very low rate of births attended by skilled birth attendants. One in five women between the ages of 20 and 24 had given birth by the time they turned 18.? 86% of women deliver at home without the presence of skilled birth attendants.? Dengue is endemic in Yemen, and usually follows seasonal patterns, with high incidence between April and August. Between 2000 and 2011, Yemen faced repeated dengue outbreaks.? In 2015, a significant increase in the rate of dengue has been reported in Al Hudaydah, Taizz, Aden, Lahj, Shabwah, and Hadramaut. More than 3,000 cases of dengue were reported between March and June 2015.? Measles is the fourth leading cause of death among children under the age of five, constituting 12% of deaths.? The prevalance of HIV in Yemen is relatively low. An estimated 0.2% of the population live with HIV.? Rates of tuberculosis have declined significantly since 1990. In 2013, 10,367 cases of tuberculosis were registered.? About 1,400 people die every year from tuberculosis.? According to a 2005 report, 75% of the population were at risk of waterborne diseases due to water contamination.? Every year, 14,700 people die of diarrhoea.? 78% of children aged 12–23 months have been immunised against measles.? Disaggregated data on immunisation rates shows approximately equivalent coverage for boys and girls.? Vaccination programmes have been disrupted in 2015 due to insecurity, and lack of fuel and electricity. As of 2012, 55% of the population had access to improved water sources.? Access to WASH facilities significantly decreased in 2015. As of the end of 2016, the UN estimated that 14.5 million people lack access to safe water and sanitation.? Increased rates of waterborne disease are a significant concern.? Unlike other countries in the Middle East, Yemen has no rivers to depend on for water resources.? Water availability has become more strained in recent years as the population has grown. A 2012 survey found that 30% of the water supply systems in Yemen were not functional, due to depletion of water sources, disrupted power supplies, and lack of resources for repairs.? More than half of Yemen’s limited water resources are used to grow khat.? As of 2012, 53% of the population had access to improved sanitation facilities.? In 2008, the majority of villages in rural areas were found to be dumping sewage in watercourses or piping it onto open ground.? In most rural areas, no government body is in charge of providing sanitation services.? Diarrhoea rates are high in Yemen, and waterborne disease outbreaks are common, particularly in rural areas.? As of the end of 2016, 4.5 million people are in need of shelter or NFIs.? Lack of adequate shelter does not only affect those displaced by conflict, but also those displaced prior to the escalation of conflict, migrants in Yemen, and Yemeni workers who have been deported from Saudi Arabia. The majority of migrants and refugees in Yemen live in substandard conditions in camps, reception centres and poor urban areas.? While many displaced people are staying with friends or family, others are staying in public buildings, makeshift structures, or out in the open.? People living in spontaneous settlements, often out of doors, are at risk of exploitation and insecurity.? Hundreds of schools are used for shelter, and both overcrowding and lack adequate WASH facilities is a concern.? The influx of displaced people into less conflict-affected areas has increased rental prices and availability of resources, affecting both displaced and host communities.? Returnees often return to communities where buildings have been severely damaged by airstrikes and fighting. Many communities lack the capacity to rebuild or prepare for potential future shocks.? Educational attainment in Yemen is low: in 2011, 86% of women and 60% of men reported that they had less than a secondary-level education. The rate of female participation in educational activities has been improving in recent decades: 29% of women aged 18–24 have no formal education, compared to 98% of women 65 or older.? Adult literacy rates are 43% for women and 77% for men.? According to the 2013 Demographic and Health Survey, only 6% of women have achieved an educational level higher than secondary school.? Children are prevented from receiving education for financial, access and socio-cultural reasons.? Only 27% of teachers are women and most schools do not employ women, which is an obstacle for parents in sending their daughters to school.? Arbitrary detention is common. Security forces affiliated with the Political Security Office and the Interior Ministry reportedly torture and abuse detainees.? Data from 2003 shows that 40% of women aged 15–49 had undergone some form of FGM. The practice is believed to be most prevalent in urban areas and along the coast. Women’s right groups report that prevalence of FGM in Al Maharah and Al Hudaydah governorates may be as high as 90%? There is no minimum legal age for marriage. 54% of female respondents in a 2010 survey reported they were married at the age of 16 or younger. 67% of male respondents reported being married at age 20 or older. The adolescent birth rate is 80 births per 1,000 girls aged 15–19.? All major armed groups and state forces are recruiting children.? Analysts estimate that around 30-40% of Houthi fighters are under the age of 18, with around 15-25% under the age of 16.? Also referred to as Akhdam, the Muhamasheen are a small minority group that live on the outskirts of major cities and are subject to discrimination.? Many Muhamasheen lack identification papers, and have lower rates of education and employment than other Yemenis.? Accurate figures on the size of the Muhamasheen population are not available, with an estimate ranging from 500,000–3.5 million.? Migrants arriving or transiting in Yemen by the Gulf of Aden or the Red Sea are at risk of dehydration, physical abuse, sexual abuse, kidnapping, arbitrary arrest, detention, and deportation. The use of detention for irregular migrants, including asylum seekers, has increased in recent years: migrants are regularly arrested and detained upon arrival.? Migrants are also at risk of trafficking, forced labour, or other methods of exploitation.? Yemeni migrants deported from Saudi Arabia are subject to human rights abuse and receive little aid from the authorities upon arrival in Yemen. ?